ranchers, agricultural professionals and educators, and citizens in Montana (audience, hereafter) gain knowledge and share experiences related to sustainable agriculture principles and tactics. The knowledge gained and experiences shares should, in turn, strengthen the audience’s ability to make informed decisions related to sustainable agriculture and natural resource management. food production, and crop-livestock integration. b) Context, justification and assumptions. humankind to respond to global challenges such as population growth and climate change. grow green manures and cover crops instead of crops or animals for direct human consumption. with reported increased soil health and ecosystem services, as well as socio-economic benefits. enhance the adoption of sustainable practices. Montana Organic Advisory and Education Council (OEAC, http://www.oaecmt.org/ourmission. tours in sustainable agriculture through competitive-mini grants program. Extension personnel to participate at regional or national meetings on sustainable agriculture. Montana is interested in promoting the adoption of sustainable agricultural practices through a focused educational outreach program targeting agricultural professionals in both the conventional and non-conventional realms. The goal of this outreach is to improve the knowledge base of agricultural consultants and to encourage adoption of sustainable practices by professionals and producers. The primary mechanism of this is the mini-grant program which provides a small grant to agricultural experts to attend workshops, professional development, field tours and other programs to educate themselves in sustainable practices. These professionals then provide workshops, outreach, publications, and seminars to other professionals and directly to the producers. On farm demonstrations, hands-on activities and research plots are encouraged in an effort to engage growers and community members. Enhance agricultural professionals' knowledge and abilities in the area of sustainable agriculture through the funding of travel scholarships (mini-grants) to attend workshops, conferences and seminars related to sustainable agriculture. The goal is to improve the knowledge and understanding of the agricultural consultant which is then transferred to the producer via workshops, seminars, demonstrations, and other outreach mechanisms. The Montana Western SARE professional development program supported four travel scholarships in 2018 for thirteen MSU Extension Agents and five producers to improve their knowledge base through attendance of professional conferences, field days, and train-the-trainer opportunities. Eight Agents shared a $2800 travel scholarship to attend the National Association of County Ag Agent (NACAA) conference in Chattanooga TN. This opportunity allowed the agents to network with other Extension educators throughout the Country and to obtain valuable ideas, knowledge, and skills in sustainable agriculture. SARE programming was showcased through an entire concurrent session over the three day conference and included field tours as well as super-seminars and colleague presentations. Two Extension Specialists each received a scholarship to attend conferences one a training in Utah on poisonous plants and the other a train-the-trainer program on recognizing herbicide injury at UC Davis. 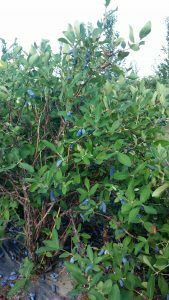 Three agents and five producers attended a field demonstration, seminar and research plot on growing Haskaps, (honeyberries) in cold climates in Saskatchewan Canada through a travel grant. The agents attending NACAA were able to bring back new ideas, new innovations, knowledge, skills and abilities to improve their outreach and programming goals. Alison Kosto, Broadwater Count Agent stated: “I gained the most from getting ideas and inspiration from other states and programs. I came back with a few ideas of programs that I may try to implement in my county.” Pat McGlynn, Flathead County Agent attended a session on growing industrial hemp that described the challenges and opportunities for production of this crop. Wendy Becker, Fort Peck Reservation Agent attended the horticultural pre-tour with Agents across the nation. Though she was the only non-horticultural assigned agent on the tour, the other agents embraced her company and engaged her in conversations from high tunnels to vineyards. This created an unique learning environment for Wendy and she developed lasting relationships with colleagues from other regions. 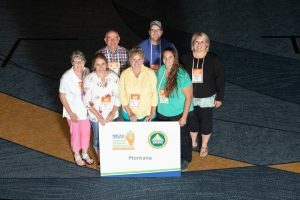 Montana was also recognized by earning several national awards, winning the Search for Excellence in three of nine areas: 4-H Education Programming, Sustainable Agriculture, and Crop Production; as well as having a national finalist in the Environmental Quality, Forestry & Natural Resources area. Montana also won the Educational Poster contest and had a national finalist in the Research poster contest, and was well represented in the communications area with a national finalist and a regional award as well. Noelle Orloff, attended a national conference on Sustainable Poisonous Plant Management in St. George Utah. The Specialist is now in the process of creating a new joint publication with NRCS about poisonous plants of concern in Montana. She increased her knowledge base of poisonous plant identification, gained an appreciation of her knowledge gaps, and fostered a collaborative spirit in her to reach out to her colleagues in Animal and Range Sciences for future projects. Tim Seipel is the new Crop Weed Specialists and in an effort to improve his knowledge base of how herbicides affect non-target plants he attended the train-the-trainer seminar “Herbicide Symptom diagnosis hosted by UC Davis. Tim learned to better identify herbicide injury on a diverse group of crops and how to apply different rates to recreate herbicide injury symptoms in field demonstrations in Montana for Agent professional development. Tim returned to Montana and held four workshops on herbicide carryover and injury, training a total of 126 producers and professionals. 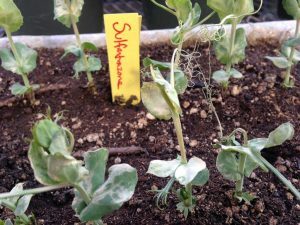 Pea plants demonstrating Sulfentrazone (Spartan) injury from techniques learned at the UC Davis seminar. Photo credit: Tim Seipel. Finally, Western SARE PDP mini-grants provided travel funds for three Extension Agents and Five producers to attend an international conference in Saskatoon Canada on growing Haskaps a new potential fruit for Montana. The conference provided the participants with knowledge of the challenges and rewards associated with growing haskaps, as well as the current research and trials being done in a climatically similar region. Pollinator presence and importance in the production of the berries was discussed by Montana’s Western Ag Research Center Superintendent, Zach Miller. Growing, harvesting and marketing of haskaps and networking with growers proved to be the most valuable parts of the event. To provide quality education to producers, consultants, agricultural professionals and the community through workshops, seminars, field days, demonstrations and on farm research funded by the Montana mini-grant program. The Montana Western SARE mini-grant program provided funding for nine workshops, a farm tour, a range tour and a field day where producers and agency personnel exchange information, ideas and were educated. The Grass to Grill workshops funded by a $3000 mini-grant to Elin Westover, Carter/Fallon County Extension agent brought innovative education to rural communities and a value added product to tables. 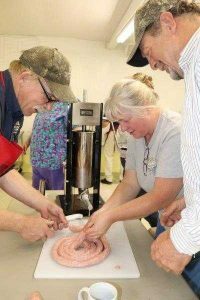 Funds were used to purchase sausage making equipment, create curriculum, and train regional Extension Agents collaborated to provide six workshops in southeast Montana. The educational focus was on food safety, sausage ingredients, flavor mixing, cuts of meat, basic sausage making, and equipment to increase awareness of meat processing and utilizing value added cuts of meat. A range tour was conducted by Roosevelt County Extension Agent Jeffery Chilson in collaboration with the regional NRCS offices. The participants traveled to the field to address noxious weed management in range and pasture, range monitoring strategies using technology, solar water pumping, and bale grazing. Publications, handouts and advertising for the event were funded through a mini-grant. The Organic Advisory and Education Council (OAEC) teamed up with the Western Agricultural Research Center (WARC) to host the 2018 Farm Tours and Organic Principles Review in the Bitterroot Valley of Southwestern Montana with their Western SARE PDP mini-grant. The tour focused on integrated organic weed management, soil fertility, and the sustainability of organic grain, fruit and vegetable production. The tour visited Luna Llena Vineyards, Tucker Family Farms, Mill Crick Farm, and WARC where research leads to improved production. Extension Educator, Elizabeth Werk, Fort Belknap Reservation Agent, held a workshop and field tour revolving around the use of solar pumps in the remote areas of the reservation where power access is limited. The Western SARE PDP grant helped to cover the travel costs of their speakers. 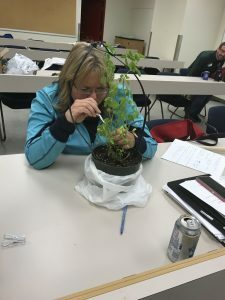 With Western SARE PDP grant funds, Mary Burrows, Extension Plant Pathologist, hosted an integrated pest management workshop focusing on entomology. County Extension Agents, CCA’s, and other agricultural professionals learned about the Schutter Diagnostic Laboratory, Plant Growth Center and entomology research centers. The program provided hands-on experiential learning of integrated pest management practices including pest identification, management strategies, and integrated alternatives to chemicals. Alternative Energy Resources Organization (AERO) received a mini-grant that was used to support grower attendance for five “Farmer Fellows” to their annual EXPO held in Missoula MT. The “Fellows” program covers the cost of their attendance in exchange for a detailed report of their experiences, knowledge gained, and skills acquired while at the conference. The keynote speaker was Dr. Miguel Altieri, who spoke to participants about “Scaling Up Agroecology For Climate Resilience and Food Sovereignty”. The program included several presentations under four broad topics, home arts building, ag, energy and resilience which were presented both in either a practical skill based manner or a more academic/research based venue. Lectures were provided on specialty grain breeding, production, and marketing; and integrated weed management in organic systems. Field tours were provided in conjunction with the lectures highlighting the research being conducted at MSU’s Western Agricultural Research Center (WARC) in Corvallis MT. Thirty one MSU Extension agents participated in six professional development workshops providing them with skills, knowledge and abilities that helped them provide education and training to their clientele. 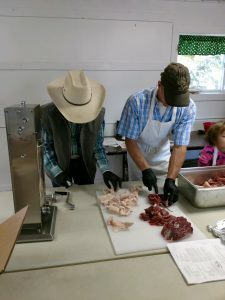 The sausage workshops were repeated by the trained agents in five more locations just prior to hunting season, bringing the value added meat program to 85 attendees and allowing them to take their newly acquired knowledge home and put it to use immediately. Participants that had never made sausage before indicated a greater confidence in making the specialty meats, purchasing and operating equipment, and ensuring they created a safe product to eat. Many attendees indicated that they were more likely to try making their own sausage and were more attentive to ingredients in commercial sausages. Plans for future workshops throughout the fall and winter of 2018-2019 will ensure that the education is provided region-wide. 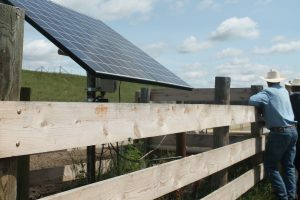 Forty-seven farmer/ranchers, NRCS specialists, and Extension agents learned about using solar power to pump water to stock wells and improve range and pasture land values in two separate workshops. The range tour was rated a 4.75 out of possible 5 by the attendees, 100% indicated that the information they received improved their range management knowledge, and 83% agreed they had learned something new in the workshop. Fruit production and organic farming in Montana are two areas of sustainable agriculture that is seeing an increase in acceptance and interest. The Organic Advisory and Education Council (OAEC) tour brought the two concepts together in one impactful workshop. The Bitterroot Valley tour engaged 45 growers in an experiential learning environment where they learned from on farm demonstrations, research plots, and consulted experts about topics such as controlling hard to kill weeds like bindweed, and incorporating cover crops in organic fruit production fields. The IPM workshop brought about a change in professionals attitude and behavior by improving their confidence in providing integrated approaches to pest problems as an alternative to conventional chemical applications. Nearly 90% of the participants will use IPM strategies in their business operations. Participants of the AERO workshops indicated that they improved their knowledge in the area of growing and processing crops as well as in forming and engaging with cooperatives. Dr. Altieri’s most significant impact on the growers was to encourage them to be “lighthouses” where they serve as examples and mentors to other producers interested in farming with a holistic systems approach. Creating publications that are easily disseminated can change the attitudes, skills and abilities of agricultural professionals and growers over a broad range of topics. Increasing awareness and encouraging adoption of sustainable farming practices is the main goal of Western SARE related publications. The creation of wildfire preparedness packets was the brainchild of Domonique Woodham the Natural Resources Agent in Gallatin County, with her WSARE grant. Domonique created kits that included the following booklets and pamphlets: The Montana Wildfire Information Directory; Improving Agricultural Sustainability Following Wildfire; Fire Prevention on the Farm & Ranch; How to Prepare Your Home for Wildfires; Living With Fire-Homeowners Fire Sage Guide for Montana; Ready, Set, Go Montana; Quick Guide for Landowners to Manage Their Noxious Weeds After Fire; and Integrated Noxious Weeds Management After Wildfires. These kits were distributed to interested persons through eight separate events held throughout the summer, and to 18 counties in Montana as well as five adjacent states. An unintended outcome of the kit preparation was the creation of the Improving Sustainability Following Wildfire booklet that is specifically focused on agricultural operations including cropping and livestock. Survey respondents indicated that they learned valuable information from the kits and the Director of the Northern Plains Climate Hub, Danelle Peck shared the kits in Washington DC with other climate science directors. Those directors expressed enthusiasm for the kits and the desire to replicate them in their own home states. Two mini-grant recipients were unable to complete their projects by the end of 2018 and have been given a no-cost extension for 2019. Both projects deal with livestock projects that will impact the grazing and feeding management of cattle and sheep in their regions. Brent Reoder’s (MSU Extension Sheep Specialist) project deals with the analysis of small grain forages that are under pivot but may result in nitrate accumulations in the crop that is outside the irrigation’s influence. Wendy Becker’s (Fort Peck Reservation Agent) project seeks to determine the palatibility and grazing acceptance of the new invasive weed narrow-leaf hawksbeard. Both of these projects will be very important to the livestock producers in Montana. Montana State Western SARE Coordinator, Shelley Mills provided a “Tips for Applying for Western SARE Professional Development Grants” workshop at MSU Extension’s annual conference in October. The program was a hands-on experiential training that involved breaking the 17 attendees up into small groups of 5 or 6 and having them identify the elements of a grant. During the process the participants were required to determine topics that met the criteria for sustainable agriculture as well as being a professional development opportunity. From that exercise the groups were then instructed to choose one topic that fit both areas and follow the instructor in a step-by-step process of writing the grant. The attendees were engaged and active the entire hour and in fact lamented that they did not have more time to finish the process. Outcomes of the workshop were: a ranking of 4.94 out of a possible 5 from the seventeen workshop participants. Testimonials provided include: “I feel I am better prepared to write my next grant proposal”; “Well organized and informative”; “Kept us engaged, helped us build knowledge for the grant process and flesh out a draft proposal”; and “Valuable use of my time”. Of the agents and specialists that attended, 100% indicted that they improved their confidence level and 65% said they will apply for a Western SARE PDP grant in 2019. Other behavior changes indicated on the survey included: I will look for opportunities where Western SARE grants could apply, and I will thoroughly read the call for proposals.